Credit: X-ray: NASA/CXC/Penn State/E.Feigelson & K.Getman et al. ; Optical: NASA/ESA/STScI/M. Robberto et al. 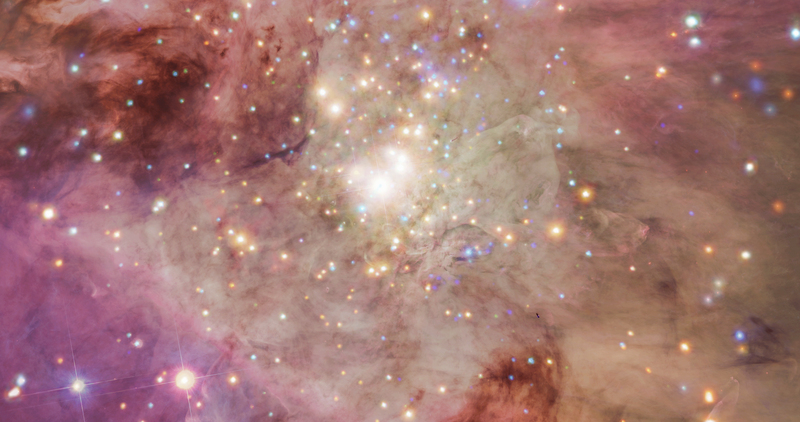 At a distance of about 1,500 light years, the Orion Nebula is one of the closest star formation regions to Earth. This makes Orion — a favorite for amateur astronomers and casual sky watchers — an excellent location to study how stars are born and behave during their stellar childhoods. 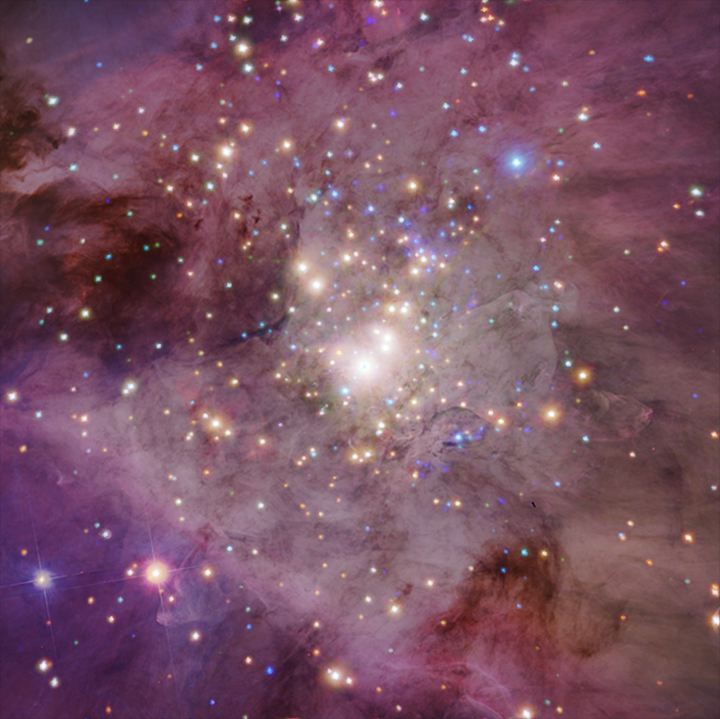 In this composite image, the central region of Orion is seen as never before through NASA's Chandra X-ray Observatory and the Hubble Space Telescope. 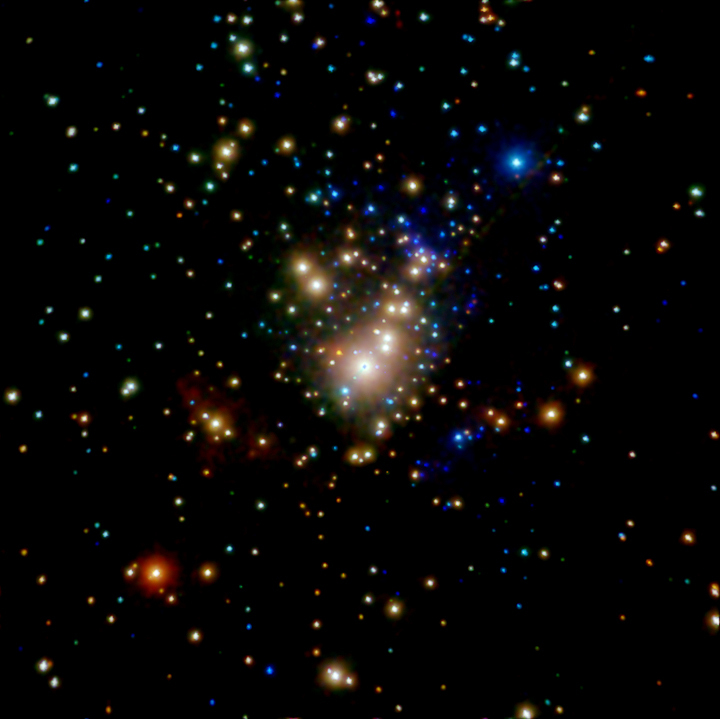 The bright point-like sources (blue and orange) in this image are the newly formed stars captured in X-ray light by a long series of Chandra observations. These nearly continuous observations, lasting almost 13 days, allowed astronomers to monitor the activity of Sun-like stars between 1 and 10 million years old. The fledgling stars were seen to flare in their X-ray intensity much more than our Sun does today. This suggests our Sun had many violent and energetic outbursts when it was much younger. The wispy filaments (pink and purple) are clouds of gas and dust as seen by Hubble in optical light. This gas and dust will one day condense into disks of material from which future generations of stars will be born. Credit X-ray: NASA/CXC/Penn State/E.Feigelson & K.Getman et al. ; Optical: NASA/ESA/STScI/M. Robberto et al.